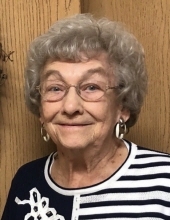 Melba J. Fetters (Koontz) of Bourbon passed away on March 15, 2019. Melba, the daughter of Eugene and Ethel Koontz, was born in Fort Wayne, Indiana. When Melba was in 5th grade she and her family moved to Bourbon where she lived out the remainder of her life. After graduating from Bourbon High School in 1946, Melba married the love of her life, Mack Fetters, on Easter Sunday - March 25, 1951. Melba and Mack celebrated their 67th anniversary March 25, 2018 just before Mack’s passing on March 27, 2018. Partnering with Mack in the shared life of farming, Melba labored tirelessly as mother to five children, as an active church member serving on a number of committees, and as a loving friend to so many. Melba loved Jesus, adored her husband, loved her five children and their spouses, her 13 grandchildren, and 8 great grandchildren. By those outside of her immediate family, Melba was known as a good friend - someone who was always willing to lend an ear to one in need and then do everything within her power to help. While seldom choosing to take a public role, Melba was always working behind the scenes to achieve good for others. She was an exceptional woman who lived a kind and generous life and who was faithful to the end. Melba is survived by her brother Gene Koontz of Fort Wayne, sister Carol May Ames (husband Fred) of Union Mills, children Jeff Fetters (wife Marty) of Owatonna, MN, Greg Fetters (wife Tanya) of Charlotte, NC, Jan Miller (husband Barry) of Plymouth, IN, Mark Fetters (wife Beth) of Carmel, IN, and Rod Fetters (wife Paris) of Ossian, IN. Melba was the proud grandmother of Sarell Hochstetler, 36 (husband Jeff), Ben Fetters, 36 (wife Stacia), Seth Miller, 34, Harmony Fetters, 33, Spencer Fetters, 33 (wife Jenny), Andrew Fetters, 30, Philip Fetters, 30, Brett Fetters, 30, Scott Fetters, 29, Ashley Fetters, 29, Audrey Miller, 27, Chad Miller, 26, and Abigail Fetters 23. Melba also delighted in her eight great grandchildren: Kylar, Korie, Cademin, Karsyn, Carlee, Lyric, Dylan, and Aria. The funeral service will begin at 2:00 p.m. Saturday, March 23rd at Deaton-Clemens Funeral Home (115 South Main Street in Bourbon). Visitation will be held prior to the service beginning at 11:00 a.m.
services. Condolences may be left at deatonclemensfh.com. To send flowers or a remembrance gift to the family of Melba J Fetters, please visit our Tribute Store. "Email Address" would like to share the life celebration of Melba J Fetters. Click on the "link" to go to share a favorite memory or leave a condolence message for the family.